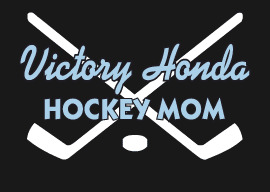 VICTORY HONDA HOCKEY MOM APPAREL is now available to order online! NEXT ORDER DEADLINE IS SUNDAY, SEPTEMBER 23rd. 1. "IN-STORE PICK UP" - When complete, your order will be distributed through your team network. (no additional charge). 2. "US MAIL" - When complete, your order will be mailed US MAIL to the address on the order. There is an additional charge for this option. (cheapest of the home delivery options). 3. UPS GROUND - When complete, your order will be shipped UPS GROUND to the address on the order. There is an additional charge for this option (most expensive of the home delivery options).